Two concerts are produced jointly each July by Warwick Castle (part of Tussauds group) and the Warwick Festival. 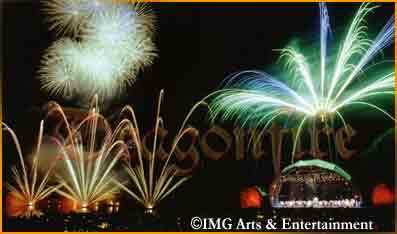 Dragonfire has serviced these events since 1994, providing a full technical service of stage, light, sound, fireworks, and special effects. Dragonfire is able to provide a design overview for the whole production, so that the visual presentation of the concert is carefully choreographed and co-ordinated. A feature of the concert is the variety and scale of the effects, often using a themed structure to accompany the live performance with the City of Birmingham Symphony Orchestra. Thus Holst’s "The Planets" was accompanied by a dramatic fire sculpture of Saturn rising and setting behind the stage, accompanied by fireworks in ring patterns and saturn shells. Stravinksy’s "Firebird" used a phoenix motif, and the lighting was co-ordinated with the colour changes of the fireworks. This is a regular annual event, with the Hallé Orchestra performing lakeside at Tatton Park to 10,000 spectators. Dragonfire provides a creative consultancy as well as a full package of all the production elements for the concert. The beautiful setting compensates for a principle design factor – a height restriction to 400ft because of the proximity of Manchester Airport. This proves to be no handicap, as the emphasis is put on the artistry of multiple firing sites around and on the lake. Using a state of the art firing system and complex choreography, the display is synchronised to the orchestra’s performance. As at Warwick Castle, it is a pleasure to work for a promoter that places significant value on high production standards. The result is an event that has very high levels of return visits, sells out on advance ticket sales, and is commercially very successful. The event has won two “Business through Tourism” awards for Tatton Park. A long established charity fund raiser, organised to support the Francis House children’s hospice. 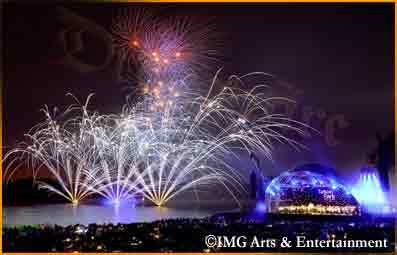 Dragonfire provides a firework display each year for this very popular concert event. As the purpose is fundraising, the emphasis is on the best possible value for the client. The promoter needs the suppliers to be self sufficient, and requires a show that is as spectacular as possible, without compromising safety standards in any way. By building a strong relationship with the venue, and the other supply companies, Dragonfire is a willing team player on this production. We also ensure that the same personnel handle the planning, design, and implementation of the display, so that the person there on the day is the person with whom everyone has been dealing prior to the event. Over the years, this event has proven the value of fireworks in attracting large family based audiences. Our particular expertise, safe, creative, spectacular fireworks, makes an invaluable contribution to the popularity of this successful fund-raiser. In 2006 this event transferred to the Cheshire County Showground just 4 miles from Arley Hall. I did not get the opportunity to see you on Sunday night before you left but I wanted to say what an amazing display you put on this year (yet again). The timing of the fireworks was superb and the special effect worked brilliantly and looked fabulous from the back of the field. Well done to you and your team for a marvellous display. For the next 30 minutes we were captivated by an experience of fire, light and noise, perfectly synchronised with the music. The event surpassed all our expectations and completely transfixed the audience. Altogether it was a truly memorable evening . Fantastic fireworks & stunning special effects, all set to the glorious music performed by the Hallé. Spectator’s letter Tatton Park concert. This was magnificent stuff, complete with a huge burning Saturn behind the stage. I've never seen a better example of fireworks interpreting the music. The colours ,shapes and bangs were all incredibly orchestrated to fit. Give that man a job directing music for TV - he can actually read a score.